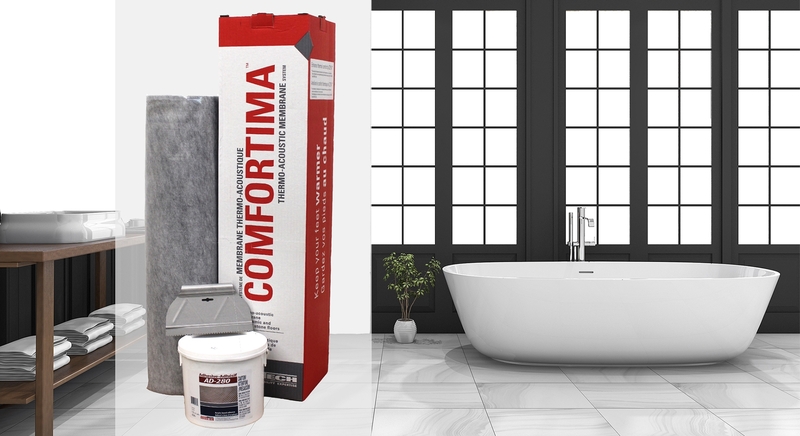 Many options are available to help you reach a certain degree of comfort under your feet, mainly on surfaces that have no thermal barrier such as ceramic. Among the solutions, we think of different heating floors systems. Even if they are very efficient, this solution may be expensive and complex to install. However, did you know that there is on the market high-end thermo-acoustic membranes allowing to block the cold transmission from the subfloor? Even if they don’t include a heating system, the thermo-acoustic membranes block the cold and reflect the heat from the room toward the floor to keep it warmer. The price of the heating floor is estimated at 10$ per square foot plus electric installation. But the price of the membrane’s system is as low as a little less than 3$ per square foot. Ideal for an installation under the ceramic, they are protecting your flooring against joints cracking. Tested light commercial, they ensure a superior performance. You are living in a co-ownership building? You are probably aware of the soundproofing challenges between the different units. Great! You will be pleased to know that this membrane is solution to install the installation of a ceramic, natural stone or marble respecting the acoustical recommendations. You still want to go with the installation of a heating floor? Using a thermo-acoustic membrane still a wise choice. Being compatible with radiant, electric and hydronic heating systems, it increases in a considerable way the performance of the system by spreading the heat in the best possible manner. Thermo-acoustic membranes had shown a long-term performance and durability, an energy saving and they increase the value of your home. So, why go without? You probably ask yourself where you can get this type of product. AcoustiTECH offers the COMFORTIMA system including the membrane, the glue and the trowel for the installation. A proven system since many years.